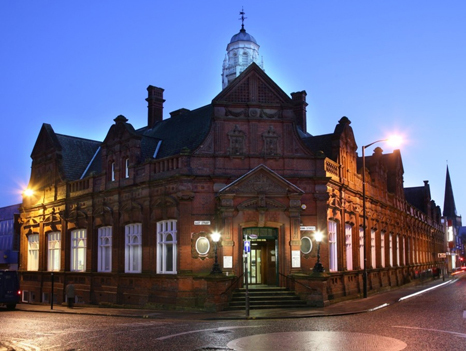 Darlington Library was opened in 1885 and was a bequest from the will of Edward Pease (1834–1880). The Library was known as the Edward Pease Free Library and this Quaker family donated many of their own books, photographs and paintings to the collection. Other donations were made by prominent local families and this generosity continues today with donations from local people, which allow the collections to develop and expand. The paintings held in the Centre for Local Studies are mainly portraits of Darlington men and women who have made a notable contribution to the history of the town. Many of the paintings are of buildings and scenes of Darlington and the area and form an historic and valuble record for study now and for future generations. The Collection includes much-loved works painted for the Library and many of the smaller works are used in temporary displays in the Centre for Local Studies at the Library in Crown Street.